"Ken: I'm planning to take the Deep Class. I have a couple of questions regarding the gear configuration for the class. What size of tank do you recommend? I'm planing to buy a steal tank (and later buy other to make a twin set) and was wondering what size should I buy? It's recommended for tech diving the type of valves that are both Yoke and DIN, the so called Thermo Pro Valves?" Now for the gear questions. 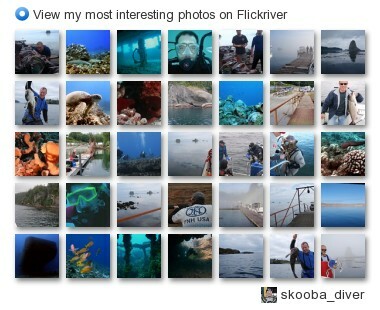 Starting with tanks you will probably hear as many opinions as there are divers. I will offer mine and let you know why I feel that way. 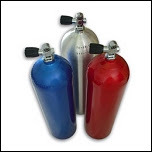 First, if you are considering tanks that will eventually end up in twins, and diving in deeper than recreational limits with the proper training I would recommend you choose low pressure high capacity tanks. The favorite "gold standard" tanks for years are the Faber LP 104s. Here's the reasons. First, with a low pressure tank you can "bump" the pressure to gain a little extra capacity; especially when they are new and have the + rating which allows for 10% gain. So a 104 turns into a 110 really easy. It also means you have 110 cubic feet at only 2700 psi. You may remember from your open water class that as you go deeper the density increases. At deeper depths little problems can become big issues. If you blow a hp hose at 30' it's a hassle, but if you blow a hp hose at 165' you have serious issues. Keeping the pressure down is always a good thing. It's easier on your gear (regs, hoses, o-rings), and easier to blend mixes if you ever decide to dive trimix or even nitrox in the tanks. Another good tank is the OMS (Faber) 98's. You have to look around for them; many stores now carry the medium pressure (3000 psi working pressure PST or Worthington tanks) They're a great tank, but not ideal based on the previous reasons. Faber also made a LP Steel 112 rated at 2400 psi, but it's a monster. And unless you're a really big guy it's a ton to carry on your back. Now some guys will probably have smoke coming out of their ears about now and swear on twining up a set of HP 100s. I don't fall into that camp. I've seen too many pressure failures at 3500 psi, and don't want to risk it if I'm deep and have a choice. Valves are less of a choice. You will usually get whatever you get on the tank; and quite honestly there isn't that much difference. Plus, when you twin them up you'll get a new manifold anyway. You are correct in that you want to convert everything to DIN. A captured o-ring is the smartest thing for deeper dives. Most of the newer DIN valves have an insert if you want to throw a yoke on it in a pinch. Pony bottle size is your preference. Usually you want at least 19 cu ft in either aluminum or steel. Some guys dive a 30 cu ft tank; but it's a little large in my opinion. Regulator quality for the pony is a resource (money to spend) question. 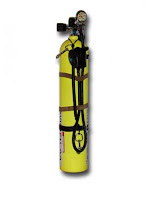 An unbalaced (less expensive) regulator will work fine, but will breath much harder at depth. Which means you will consume more air than if you had a balanced regulator. And one could assume that if you need to jump to your pony bottle in an emergency, less air consumption is better; especially if you have a small pony. One of the drills we do in class is to calculate and breath off a pony bottle at depth to see what kind of time we actually have. Also, it's nice to have a DIN on your pony as well since it will be much more compact that way. One of the things we spend a lot of time reviewing and discussing in this class is the gear configuration, so if you don't get all the answers you need we cover it in class. We spend a couple of hours on the beach reviewing gear, the dives, standards, objectives and answering questions. 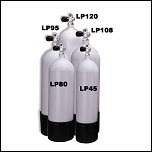 Manufacturer - Material - Cubic Feet - Service Pressure - PSI/Cu. Ft.